A year ago I answered that it will not change my ways at all, and I still thinking the same. Which is good. It shows I have some coherence in my thoughts. Let’s talk about the present. Today is Saturday and that means that my neighbourhood is in full activity all day. Music, dance, everybody in the streets, and a lot of joy and noise from early in the morning till late at night. No room for boredom. A thunderstorm didn’t discourage my neighbours and our visitors to hit the streets. They simply waited until it passed and continued with their outdoors activities. 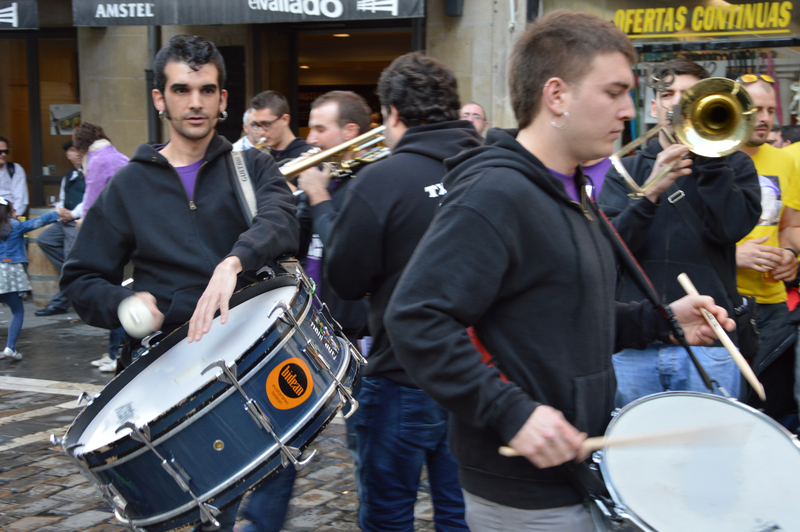 There was a festive small music band called “Txaranga” playing in the City Hall square, with a group of youngsters having fun. When they left with their music to another street, followed by the group of youngsters dancing and singing, a folkloric group arrived and began to dance at the same spot. As I said, there is no room for boredom in my neighbourhood. Sounds like a great neighbourhood, although our local market town of Solothurn is similar on Saturday. Not quite song and dance, but it is market day and that livens things up quite a lot. Great photo! Thank you. They ere pretty loud.